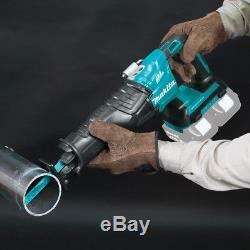 Makita XRJ06Z 18V X2 LXT Lithium-Ion Brushless Cordless Recipro Saw (Tool Only). Brand New in Original Packaging. Convenient power tool for cutting and demolition. 2 speed motor - 0-2,300 and 0-3,000 strokes per minute. X2 LXT technology - Up to 155 cuts per charge. Refined crank mechanism - Reduced deflection and vibration. Efficient - Long 1-1/4 stroke length. Practical - Built-in LED light work area illumination. Ergonomic - 17-3/4 long, 10.2 lbs in weight. Overload, over-discharge and over-heat protected. 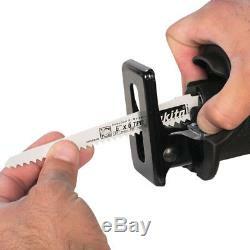 Tool-less blade change - Fast installation and removal. Makita, a pioneer in brushless motor technology and battery innovation, combines both in the 18V X2 LXT Lithium-Ion Brushless Recipro Saw Kit. It's powered by two 18V Lithium-Ion batteries for 36V power and performance, and has an electronically-controlled BL Brushless motor that matches torque and RPM to the application. Makita 18V X2 means freedom from the cord, even for demanding applications like cutting and demolition that traditionally called for a corded recipro saw. 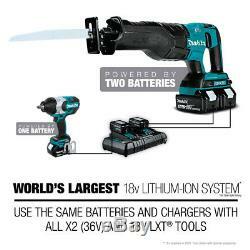 Best of all, users can remain in one battery platform, using the same fast-charging 18V batteries on the XRJ06Z as they use across the Makita 18V LXT cordless tool line-up. The XRJ06Z is equipped with efficiency features for faster cutting. The long 1-1/4 stroke length increases cutting efficiency, and the refined crank mechanism design minimizes blade deflection and reduces vibration. Convenience features include an L. Light to illuminate the line of cut, retractable tool hook, and "tool-less" blade change for faster blade installation and removal. It's part of Makita's expanding 18V Lithium-Ion series, the world's largest cordless tool line-up powered by an 18V Lithium-Ion slide-style battery. Makita 18V Lithium-Ion batteries have the fastest charge times in their categories, so they spend more time working and less time sitting on the charger. For improved tool performance and extended battery life, Makita created Star Protection Computer Controls. For increased versatility, the tool can also be powered by Makita 18V LXT and Compact Lithium-Ion batteries with the star symbol on the battery indicating Star Protection inside. Two 18V LXT Lithium-Ion Batteries deliver the power and performance of a corded recipro saw without leaving the 18V LXT platform. X2 LXT technology delivers up to 155 cuts per charge in 2x10 SPF lumber using two 5.0Ah batteries. 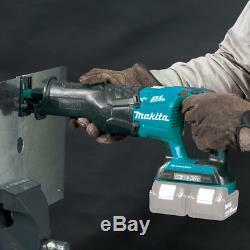 Makita-built variable 2-speed brushless motor delivers 0-2,300 (Low) and 0-3,000 (High) strokes per minute. Long 1-1/4 stroke length provides increased cutting efficiency. Refined crank mechanism design minimizes blade deflection and reduces vibration. The BL Brushless Motor eliminates carbon brushes, enabling the BL Motor to run cooler and more efficiently for longer life. Efficient BL Brushless motor is electronically controlled to optimize battery energy use for up to 50 percent longer run time per charge. Large two-finger variable speed trigger for operator convenience. "Tool-less" blade change system allows for faster blade installation and removal for increased productivity. Extreme Protection Technology is engineered for improved dust and water resistance for operation in harsh conditions. Rubberized soft grip handle provides increased comfort on the job. Light with pre-glow and afterglow illuminate the work area. Retractable tool hook secures the tool when not in use. Star Protection Computer Controls protects against overloading, over-discharging and over-heating. Rapid Optimum Charger communicates with the battery's built-in chip optimizes battery life by actively controlling current, voltage and temperature. What's in the Box. Cutting Capacity (wood w/ 12" blade) : 10". : 0 - 2,300 / 0 - 3,000 SPM. Battery : 2X 18V LXT Lithium-Ion. Variable speed control dial : No. Upon receipt, your return will be processed. Please let us know how we can make yours a five-star rated one too! Our goal is to make sure you are customer 100% satisfied with your order. 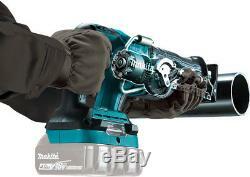 The item "Makita XRJ06Z 18V X2 LXT Lithium-Ion (36V) Brushless Cordless Reciprocating Saw" is in sale since Tuesday, March 06, 2018. This item is in the category "Home & Garden\Tools\Power Tools\Saws & Blades\Reciprocating Saws". The seller is "electroniccityinc" and is located in Merrick, New York. This item can be shipped to United States, Canada, United Kingdom, Denmark, Romania, Slovakia, Bulgaria, Czech republic, Finland, Hungary, Latvia, Lithuania, Malta, Estonia, Australia, Greece, Portugal, Cyprus, Slovenia, Japan, China, Sweden, South Korea, Indonesia, Taiwan, South africa, Thailand, Belgium, France, Hong Kong, Ireland, Netherlands, Poland, Spain, Italy, Germany, Austria, Russian federation, Israel, Mexico, New Zealand, Philippines, Singapore, Switzerland, Norway, Saudi arabia, Ukraine, United arab emirates, Qatar, Kuwait, Bahrain, Croatia, Malaysia, Brazil, Chile, Colombia, Costa rica, Dominican republic, Panama, Trinidad and tobago, Guatemala, El salvador, Honduras, Jamaica.